Our campus is situated in a silent, pollution free environment with ample transport facility, enough water and fresh air near the serene compound of St Marys Jacobite Syrian Cathedral,Manarcad,which has a tradition of centuries ,an international pilgrim centre. 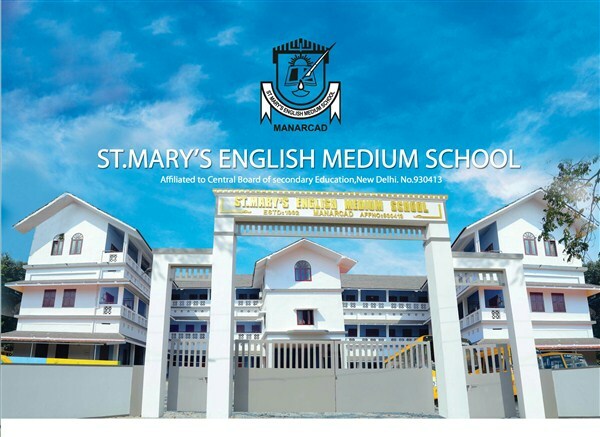 St. Mary’s English Medium School is a co- educational Secondary School owned and managed by the Global Marian Pilgrim Centre – St. Mary’s Jacobite Syrian Cathedral, Manarcad, Kottayam. The school is affiliated to Central Board of Secondary Education New Delhi(No.9304130). The school is located at Manarcadpally junction on Manarcad – Kidangoor route, close to St. Mary’s Jacobite Syrian Cathedral. It is easily accessible from Kottayam, Ettumanoor, Kidangoor, Puthuppally and Changanacherry. School buses ply in all nearby places. Children learn in an atmosphere of sanctity and serenity here. We give utmost care for the formation, reformation and transformation of the children. We believe in a training that caters both to the head and heart of the children. The experienced and enthusiastic staff members share their expertise to the children. We have consistently securing 100% pass in AISSE right from the first batch onwards. This year we have presented our 14th batch of class X students for the Board Examination.